We had a couple of Rob Roys last night to warm ourselves from the damp chill that’s been hanging over Cheever Country this week. The glasses are old Waterford coupes we scooped up at a junk shop in Hammondsport on Keuka Lake earlier this summer. Though we’ve made them before, it’s been quite some time since we indulged in the company of the Rob Roy, the classic Scotch cocktail that is a perfect antidote to cool, damp evenings. Plus, it’s made with Scotch, our house liquor. 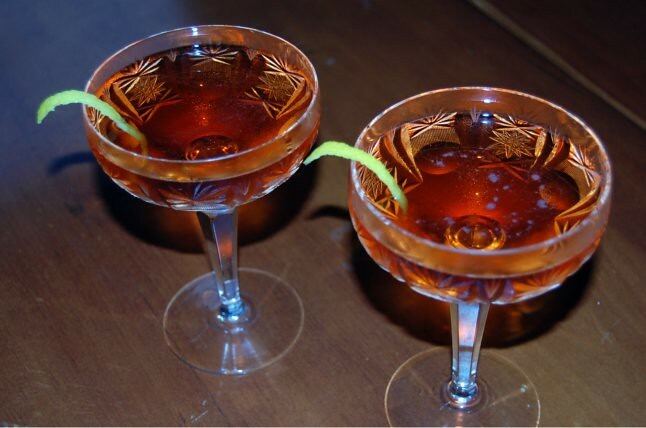 We turned to Dale DeGroff, whose recipe is simple — Scotch, Italian vermouth and Peychaud’s bitters. He tops things off with a lemon twist, which was a very nice touch. Gather the Scotch, vermouth and bitters over ice in a shaker and shake vigorously. Serve up and with a twist. Enjoy. You shake? I thought that the rule was stir when it’s only liquor, shake when there is some type of fruit juice involved.